While I love my retinol and glycolic acid for coming through on the anti-aging front, I still stand by the idea that hydration is one of the biggest ways to keep skin looking young. If the skin is dehydrated, it is more prone to wrinkles, loss of firmness - I could go on and on. So while my skincare routine does have its fair share of powerful anti-aging ingredients, the biggest issue I tackle regularly is keeping my skin well hydrated. I have always love the ideas of boosters that you can add into your routine and I have found two that are specifically designed to help hydration. Each one is good for any skin type so everyone can benefit from adding a bit more moisture into their regimen (even us gals that have oily skin). And now that we are moving into the colder seasons, I couldn't have discovered these at a better time. 1. 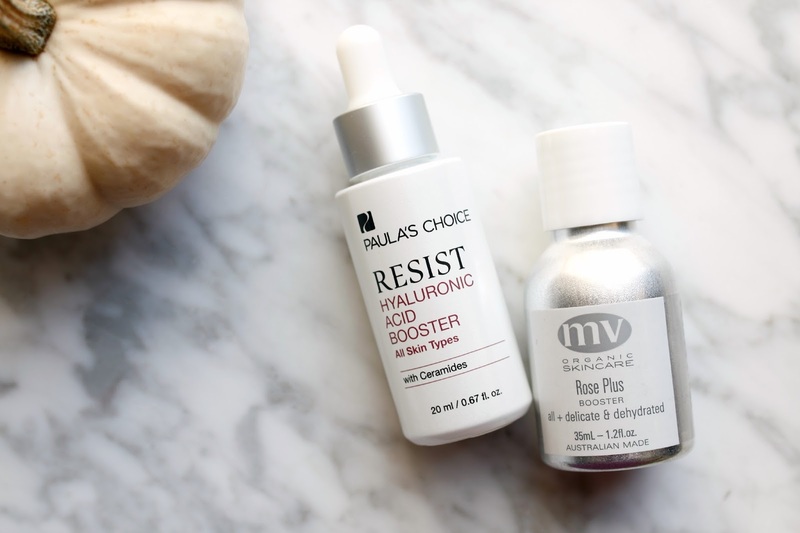 Paula's Choice Hyaluronic Acid Booster - I am new to the Paula's Choice line, but after declaring this a holy grail product (and finishing an entire bottle in less than 2 months) for helping keep my skin blemish-free, I was open to try all of the things. 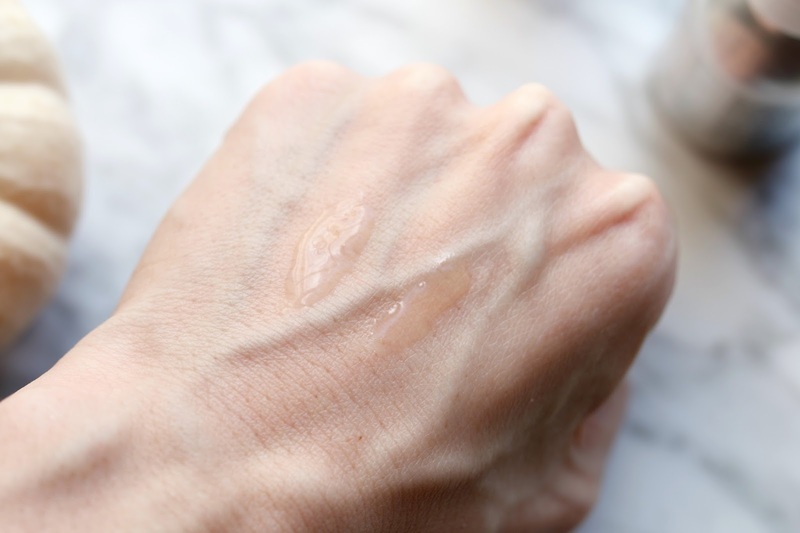 I have always like using Hyaluronic Acid in my skincare routine because not only does it help hydrate the skin immediately, but it helps the skin retain moisture longer. This immediately went into my day AND night routine before I apply my serums. It's a bit thicker than I imagined, but I only need two drops to cover my entire face and it soaks in before I can finish applying it! The first thing I notice when my skin is well hydrated is how supple and "bouncy" it becomes. While I try to remind myself to drink enough water each day, I sadly fall short many days and with the multitude of other factors (space heater at work, stress, lack of sleep, etc) trying to rob my face of its moisture #rude, I need something like this to help me hold on to every last bit of moisture in my skin that I can. 2. MV Skincare Rose Plus Booster - I knew immediately from looking at these ingredients that this would be a magical product. The list reads: Camellia Oil, Jojoba Oil, Rosehip Oil, Rose Oil, Geranium Oil, Vitamin E and Rosemary extract. That's it. Simple, yet so effective. While this is technically an oil, it is much thinner than my other oils and takes less time to absorb into the skin. However, it is one of the most nourishing and hydrating products I have ever tried! I don't use this daily, but rather just when things are bleak regarding hydration. I have been feeling run down the past two weeks and fighting off a cold, so it was the perfect time to begin testing this because I got to see how well it really does work. I use it before I apply serum or moisturizer because I like it to get right onto my damp skin. My skin felt better almost immediately and by the next morning, my skin looked plump and firm even though my overall self was still feeling icky. I like to have a few products in my arsenal for when my skin needs the utmost in pampering and TLC and this will definitely be added to that list. Both of these sound absolutely amazing! I've heard especially amazing things about MV Organics, such a beautiful brand! These sound perfect for me. Thanks! I'm in love with the MV Rose Booster. It's such a brilliant oil, especially when applied with the MV moisturiser. Oh and the scent, just divine.